Until a few years ago you would never have seen wild garlic on a menu, but these days is definitely a chefs' favourite. The whole plant is edible. The flavour is softer, more pleasant than cloves from garlic bulbs. 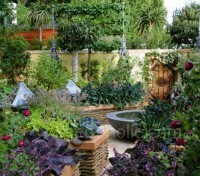 The leaves have a vibrant colour that brings food to life. 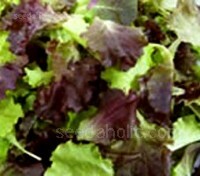 The Bright and Spicy Leaf Salad mixture contains a well balanced salad mix that is rich in colour and taste. The mix includes Greek Cress, Tatsoi, Pak Choi and the Mustards Red Zest and Red Frills. 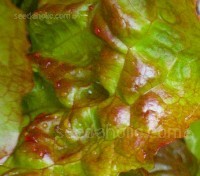 The attractive flavoursome leaves need only the lightest dressing. This salad mix is comprised of a dynamic array of niche varieties. The vivacious colours along with its well loved taste, makes this mix wonderfully enticing. 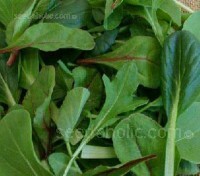 The mix contains American or Land Cress, Kale Red Russian , Red Chard, Salad Rocket and Spinach. 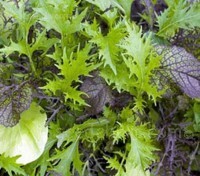 Mesclun Mix has been made for hundreds of years around Nice in Southern France. The idea was to make a salad that touches upon every taste and texture sensation: bitter, sweet, tangy, crunchy and silky. This mix is based on the traditional recipe and is a treat for the eye as well as the tongue. The Oriental Salad Mix is one of a series of six blends which provide a wide variety of colourful and tasty salads. The mix includes Mizuna, Mibuna, Red and Green Mustards, Pak Choi and Tatsoi. The vivacious colours along with its well loved taste, makes this mix wonderfully enticing. 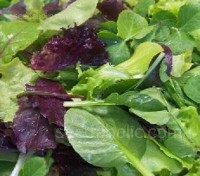 The Provence Salad mix has a light texture enriched with striking red stems portioned throughout. Containing Sorrel de Bellevile, Corn Salad Verte de Cambrai, Lettuce Rougette de Montpelier and Chervil. A tasteful mix with a warming sensation to assist any appetite. This is an exiting mix of vibrant colour and incomparable textures of salad in its youth. Containing Chicory Italico Rosso, Rocket Dentellata, Kale Nero de Toscana, Lettuce Lollo Rossa and Catalogna Cerbiata - Classic Italian leaves that will enhance presentation and flavours of any dish. 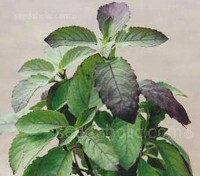 Holy basil, also called Tulsi or Sacred Basil is an ancient variety. 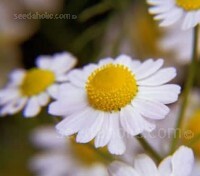 It has highly aromatic, narrow oval leaves and pink flowers with a perfumed fragrance. This reddish-purple tinted plant exudes a delicious, sweet, clove-like aroma. The hotter the summer, the deeper the purple. 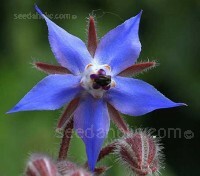 Borage is one of the most reliable sources of blue flowers, often flowering lavishly for weeks after sowing. The beautiful blue star-shaped flowers are edible and very important for bees, providing pollen and nectar in prodigious amounts. Released in 1968, Marketmore is now firmly established as one of the 'Greats' of the cucumber world. 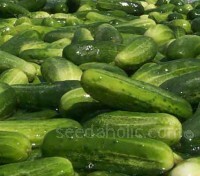 Reliable and disease resistant it produces a large amount of fruit which usually grow to over 20cm in length with a fresh, crisp and mild flavour. This fabulous range of Edible Flowers and Herbs give decorative petals and leaves for use as garnishes and flavourings. Some are spicy, and some herbaceous, while others are floral and fragrant, the range is surprising. They will bring a stunning finish to the food and drinks you that you love. 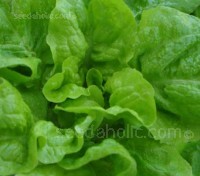 'Merveille des Quatre Saisons' Butterhead Lettuce. This French butter-head lettuce is famous for its signature butter-head shape boasting the appearance of a bibb-type rosette with an array of beautiful colours ranging in bronze, gold, red and green. The “Four Seasons” will thrive in a range of climates and its texture always remains crisp and its taste unforgettable. Marvel of Winter, Butterhead, Winter variety. 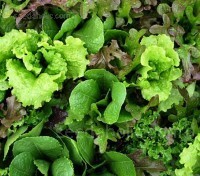 Lettuce Meraviglia d'Inverno is truly a ‘Marvel of Winter’, it is from one of the coldest regions of Italy and is hardy to around minus 10°C (14°F). Compact and tender, it will stand in perfect condition right through winter and can be harvested from September right through to March. Spoon cabbage, Taisai, Chinese mustard. 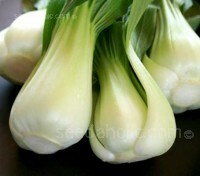 Dwarf Canton White is a short and squat variety, often known as Baby or Squat Pak Choi. Tender and delicious, with a compact habit, this fast growing vegetable can be harvested at any stage, for 'baby leaf or left to mature to thick succulent white stems. 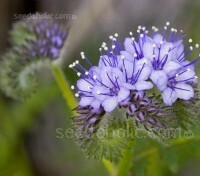 Phacelia is a very attractive plant and one with a variety of uses. Very rich in both nectar and pollen, it is listed as one of the top 20 honey-producing flowers for honeybees. 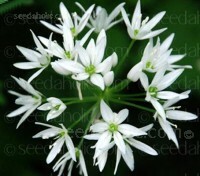 It is ideal for a wildlife-friendly planting scheme and makes a wonderful green manure. 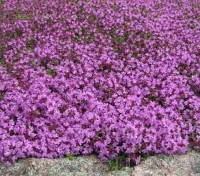 Thymus serpyllum is one of the most versatile groundcovers. Forming dense evergreen cushions of flowers these low maintenance plants don’t require mowing, watering or care, and can take a lot of abuse. 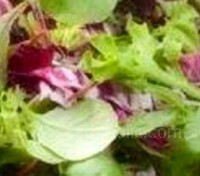 Its leaves can be used as a culinary herb and its uses in the garden are almost unlimited.